Hmm, I guess every technical trader will arrive at certain stage that he truly believe on technical analysis and felt remorse paying little attention to fundamentals. In my opinion, you just got to stick with your plan and trade with it. You never know what is tomorrow news going to be, but if you would want to wait for it, you might miss the boat and think, yea I should have SHORT at the 1st place or if I have short it earlier. Well, in trading, "If and But" are two forbidden words. What you have, if you are a technical traders, you only know you have an edge when you enter the trade, you only know that the probability is on your side when you strike and the odds for you to lose is lower, thats it period. Heck I don't even know what is going to happen for sure what is going to happen next 10 seconds. If you go to class or seminar and the so called Guru's or speaker claim that he can guarantee that he can help you achieve your financial goal or he is sure most of the time the directions of the market, that he rarely get wrong, that he will have perfect or almost perfect trade setup on every trade, that you will lose $$ or dead wrong if you did not follow his guidance or market recommendation, I can be pretty sure that he is 85% scammer. The other 5% would be a damn good traders that remain subtle, and remaining 10% would go out market their unbeatable trading skills (yea right) to public. No offence though. Ok, lets look at today's chart, this is what you all here for right. It seems that yesterday better than expected U.S GDP growth has gave stocks market a upward shock, pushing the DOW to rose about 200 points, more reason them to buy stocks and boost their confidence that economy is recovering. If you observe carefully on the FKLI chart, the small gap has been filled, just like what every technical school tells you, "Gap will be eventually filled (it just the matter of time of course)." Well, I refuse to wait for that gap to be filled because I leave the "If and But" at bay when I trade. when I strike, I only know that I have an edge, I believe in my analysis and it need some time before I can see it working. CPO is one nasty game to play, if you are have faint heart and tend to average up when something goes wrong, this baby is definitely not for you. 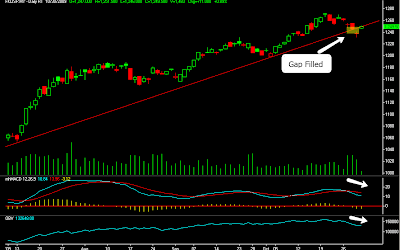 If you look at it, U should go long when the market open gap up because it confirm the trend right ? Well, not really my friend, not this time. 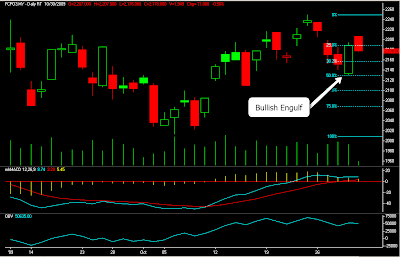 Take a look what happen after bullish engulf candle appear, market slid down right after it. Hey, u might asking yourself, this is not right, not in technical school but in reality it happen all the time. But wait, there is something you can learn from here, lets take a look on shorter time frame. 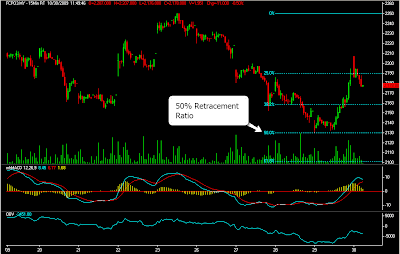 U can see it rebound from 2,130 level which is 50% Fibonacci retracement plotted on an recent uptrend. This should be the support level if the reach here again. So if you have LONG on the open or yesterday, U should where is your stop level is. Well, thats all folks, have a nice weekends.